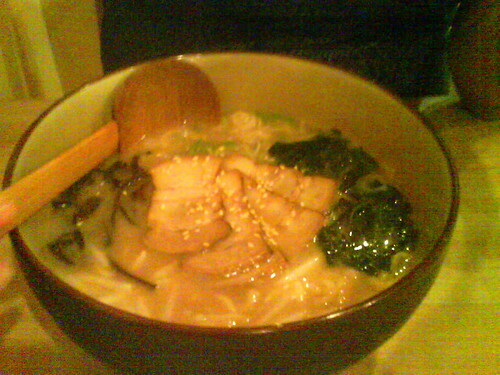 Hakata Nihon Ryori Tonkotsu Ramen, originally uploaded by Camemberu. I had read about Hakata Nihon Ryori being a nice little authentic Kyushu shop. Just had to try their tonkotsu ramen (I saw a pic of it on a blog elsewhere, with lots of kikurage, the black wood ear fungus that I love). It was not crowded when we went, but some of the clientele were Japanese. I started having my doubts though, when I was served by a Filipino waitress who knew little about the dishes served. Still, I tried to be optimistic but the ramen was disappointing. A bit bland and flavourless (or perhaps I had burnt my tastebuds earlier in the day at Aburiya?). Hubby had the cold ramen. Hmm, we both still prefer the version at Noodle House Ken's at Cuppage Plaza (my favourite!). Hakata has a very wide menu, with all sorts of items. I would still like to give them a second chance, in case it was an off day. But then again, there are so many Japanese joints to try!